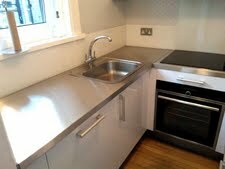 Hobbs & Porter manufacture stainless steel worktop covers for use in domestic or commercial kitchens throughout the UK. 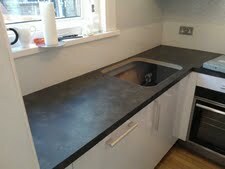 They can be tailor made as direct replacements and fit over your existing laminate kitchen worktops. Relatively quick to fit. Made from 304 grade stainless steel. Available with or without integral upstands. Our stainless steel replacement kitchen worktop covers are a cost effective way of updating your existing kitchen worktops. Made from 304 grade stainless steel they can be manufactured as a made to measure permanent cover to fit over your existing laminate worktops. Stainless steel replacement worktop covers after fitting including original sink and hob. Stainless steel worktop covers shown have a 42mm thick front edge to ensure that original 40mm workop is covered. 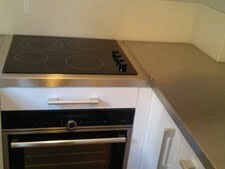 Stainless steel worktop covers showing original electric hob. Stainless steel can be fitted around any obstacle including pipe boxing as shown in picture.